Aside: I am not chasing anything today as the market is pulled very far from its 13 day moving average. If anything if S&P 1220 is broken to the downside, I’d like to do an intraday index short. 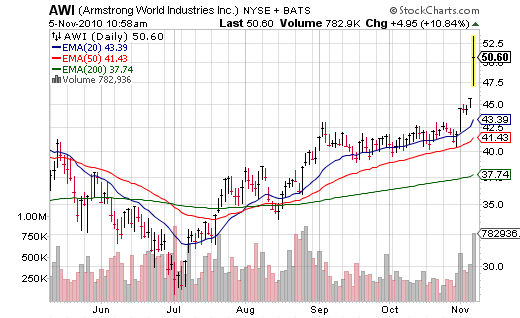 Monday, I mentioned the breakout happening in Armstrong World Industries (AWI) [Nov 1, 2010: Keeping an Eye on Armstrong World Industries] but did not want to jump in ahead of earnings. The technical breakout continued all week, and last night’s earnings caused a massive jump this morning, although the stock is giving quite a bit back already. However, it does strike me as *interesting* in terms of “information leak” to watch how the stock moved …. Armstrong World Industries Inc (AWI) posted better-than-expected quarterly profit, helped by growth at its building products segment, and raised its full-year earnings outlook. Armstrong World, which makes flooring products, ceiling systems and kitchen and bathroom cabinets, now expects 2010 adjusted earnings of $1.69-$1.79 per share, up from its prior view of $1.55-$1.75 per share. The company also narrowed its 2010 sales outlook to $2.76-$2.80 billion, from its previous outlook of $2.70-$2.85 billion. The building products segment grew 6 percent and contributed about 42 percent to sales. Higher margins at the segment helped growth. All other segments saw a decline in sales. For the July-September quarter, the company reported net income of $24.6 million, or 42 cents a share, compared with $64.4 million, or $1.12 cents a share, a year ago. Excluding items, the company earned 83 cents a share. Net sales fell about 2 percent to $739.8 million. Analysts on an average were expecting earnings of 64 cents a share on revenue of $761.1 million..